This appeared on the dog-photography website of my husband, Bob, shortly after we acquired a second canine. My husband has a thing for dachshunds. There’s something about their personality—their confidence, their swagger—that he just loves. Not to mention the Cuteness Factor, which is substantial. 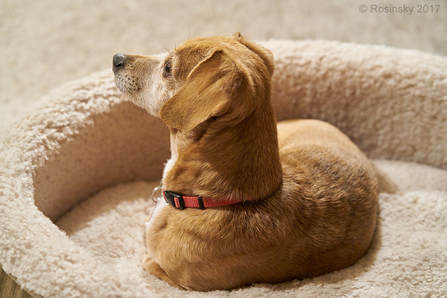 So after decades of admiring and photographing the breed, Bob decided he simply had to have a doxie. I consented, as I’ve always recognized that dogs are good for my husband’s mental health. Even though we already had our 40-pound mutt Jazz, Bob had a dearth of dachshunds. We contacted a number of dachshund rescue leagues, filled out long forms, and participated in interviews. We had to prove ourselves worthy. I think it was during my conversation with a south Florida rescue league that I began to have second thoughts about adopting a full-blooded dachshund. There was much talk about the potential need for expensive back surgery with this breed. Did we have several thousand dollars on hand? And would we be willing to spend it on our yet-to-be-adopted pet? Hmmm. Maybe we’d be better off with a dachshund-ISH dog, with a little bit of gene heterogeneity. ​This line of reasoning is what led us to our three-year-old chiweenie—half dachshund, half chihuahua—whom we ended up dubbing “Little Guy.” And this is where our lives were changed. Unpredictable. Suddenly, our lives are all about dog poop. We have to take this little mutt out many times a day and pay fanatical attention to his biorhythms. Has the chiweenie gone out? Did he poop? Did he poop more than once? And of course, there are the intermittent infuriating discoveries of unwelcome Indoor Poop. Distractible. When this dog goes outside (see item #1), all his senses go on high alert. Is that a dog barking in the next county over? Did someone sneeze two blocks away? Curious chiweenies want to know. Much of this dog’s outdoor time is spent sniffing the air and frowning at various sounds. Windblown bushes are hypnotizing. Food-focused. This dog will eat anything. Any. Thing. You name it: fruit, vegetables, whatever that is that you just dropped. And of course, he eats our other dog’s food. Thank heavens he’s as short as he is, or he’d clean us out. Undeniably cute. Why would we tolerate such a needy creature? One that requires so much cajoling and vigilant oversight? That’s easy: he’s adorable. He has a soft coat that you can’t keep your hands off of. He’ll snuggle up to you in a way that makes your heart rate plummet. And he’s got those floppy ears. And that tail! It sticks up in the air and waves proudly wherever he goes, announcing to the world that the chiweenie has arrived. ​Would Bob adopt this dog again if he’d known what he was getting into? It depends on when you ask. If Bob’s in the front yard, begging Little Guy to go potty? Probably not. But when Little Guy is curled up cozily and snoring on Bob’s lap? Then, I think Bob would admit he’s grateful that this eleven-pound canine character marched his way into our lives.